Sign up for coupons. Coupons must be signed up for prior to entry. Coupons may take up to 24 hours to arrive so sign up today. Don't miss this weeks amazing coupons click here now to signup! Join our email list to get coupons. Click here now! Each year White Post Farms works hard to produce its annual Fall Farm Festival. This event is extraordinary in its uniqueness, quality, and value. The price of admission to the Festival offers families a once- a-year experience to have fun together on a beautiful farm in the middle of otherwise suburban Long Island. There is no better family entertainment value than this. The Festival is a tradition with hundreds of families in the New York Area. If it has not yet become a tradition in your family, then this is the year to begin. How can you be sure that the Festival is as good as we claim it to be? Just stand at the gates at the end of a Festival day, and see the hundreds of happy faces glad to have spent the day together with their family and friends at White Post Farms. Long Island's favorite Fall Festival is always right at White Post Farms of Melville in Huntington, New York! We are Huntington's longest Fall Festival with six fun filled weekends and Columbus Day! White Post Farms of Melville, Long Island is one of the best places on Long Island for picking pumpkins. Our large pumpkin patch is sure to have that perfect pumpkin you are looking for. Your admission to The Fall Festival includes: Six Great Shows, (The Great Stage Show, Tricks For Treats Exotic Bird Show, Mutts Gone Nuts, Nick's Kids Show, The Magic of Jim McClenahan, Anastasini Variety Show), Sing-A-Long Hayrides, Unlimited Use of Our Bounce ‘N Slides, Our Famous Animal Farm, Singin’ Chicken Show, Animal Farm Jamboree Show, Use of our Playground Areas, Use of our Picnic Tables, Play-In-The-Hay, Entry to our Ronnie’s Birdie Landing TM and Poppie's Lorikeet Landing Free Flight Aviaries. It would not be a Fall Festival without taking the kids Pumpkin Picking in our huge pick your own pumpkin patch! Picking pumpkins is everybody's favorite activity and we have a field full of pumpkins. We are long island best place to pick that perfect pumpkin. Rodeo Ricky traveled around the USA on his Summer break and has come up with an exciting idea for his friends Kelly Anne Cassidy & Jiminy Joe! Don’t forget, everyone is invited up on stage after the show to join the gang for a dance party! Hawaii is no longer enchanted, help us find Nellie so she can sing Somewhere Over the Rainbow and restore fun back on the Island! This show will induce giggles from children and adults alike with a unique magical twist that’s fun and exciting. During our Fall Festival, Jim will bring his signature routines, original storylines, and wacky antics to White Post Farms. He is sure to delight and dazzle any audience! Giovanni Anastasini presents the Anastasini Variety Show. With over 150 years’ experience and 8 generations of entertaining crowds this performance will bring smiles and amazement to your face as they wow and dazzle the crowd with all their incredible talent. Don’t miss out on this New Show for 2018! This show is a musically entertaining show for kids of all ages. Nick invites kids on stage and gives them instruments and lets them be in his Rock 'n Roll band. Climb on board and be part of the Locomotion Train song. At Nick's Kids Show, the kids are the starts of the show! Mutts Gone Nuts' Canine Cabaret unleashes havoc and hilarity as the mischievous mutts match wits with their human companions. This family-friendly performance features a dozen amazing rescued dogs and is leaving audiences howling for more! Get onto one of our Sing-Along-Hayrides for a musical journey deep into the cornfields. For unlimited family fun, ride and sing along as often as you like! Mom and dads love to repeat this relaxing ride, over and over. Kids love to Play In The Hay and we have a large area where they can do just that! Please play responsibly and supervise your children. Choose a pumpkin from our Paint Your Own Pumpkin tent and then decorate it as you wish! Kids love being creative and with our Paint Your Own Pumpkin Craft they can do just that. This activity is available for an additional charge. Rainbow Rosie has been making some of the best face paintings around for over half a decade! Now your children have the chance to become her next work of art her face painting table! Enjoy our newest attraction Poppie's Lorikeet Landing. nectar right from your hand. Entry is included with your admission. May not be available on days of high winds or wet weather. Strollers not permitted in our aviary for the safety of our birds. Wheelchairs are permitted with caution. Our Animal Farm has been voted “Best of Long Island” two years in a row and features many animals of all different species from around the world! From antelopes to zebras we have it all. Animal food pails, pony rides and train rides are available at an additional charge. If your child has ever wanted to know what it was like to be a Cowboy or a Cowgirl then the White Post Animal Farm is the place to do just that! We have ponies of all different sizes for your child to ride on. Pony rides make a great photo opportunity as well as great memories! purchase at the main entrance as well as near the Pony Ride Station. Due to the fact that they are ponies and not full grown horses there is a weight limit of 65 lbs. per rider. Kids will love to take a ride on our Farmland Express Old Fashioned Train Ride. A mini-replica of the trains of yesterday that you can ride today! One token per rider child or adult. Children under the height of 36" must ride with an adult. It’s not a Fall Festival without Festival Foods! We have all your favorites! From roasted corn, fresh pies, candy apples, cotton candy, corn dogs, hot dogs, funnel cakes and fresh fudge. We also have every day favorites available such as pizza, burgers, chicken sandwiches and chicken nuggets. Food is available at our Pumpkin Patch Café field concession to the right of the Great Stage as well as our concession located near our Koi pond. These areas are both cash only. 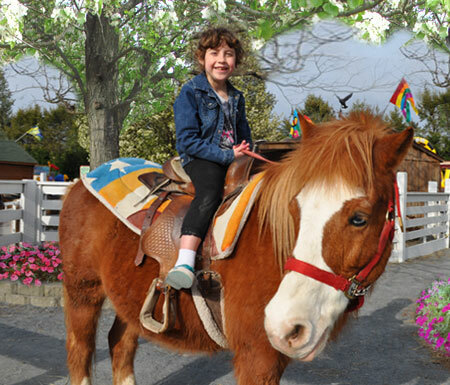 White Post Farms Children's Pony Parties have been voted "Best of Long Island" for the past seven years in a row! This is due to our no hassle party planning that makes your child's birthday party a special one. Our motto is "Sit back and relax... we take care of everything". On the day of your child's birthday party all you have to do is show up. We provide all the setup, decorating, and cleanup! We take out all the normal anxiety of planning a party for your child.